The playgroups are geared towards children who may need some additional support with peer interactions, focusing on pro-social behavior and social communication skills. 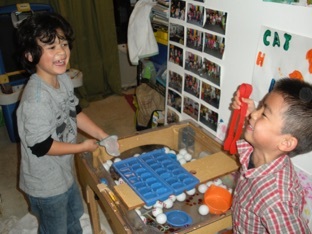 This would include things such as visual referencing, strengthening verbal expression, reading facial expressions, reading gestures, recognizing and labeling emotions in self and others, appropriate emotional expression, body awareness, problem solving, empathy, self regulation, and participation in an optimal individual sensory diet. The focus of the group is to help the children experience the importance and joys of having friends, being part of a group, and identifying individual regulation strategies. In this nurturing atmosphere that fosters knowledge of sensory differences and individual regulation needs, children begin to learn how to be more respectful of others and grow in their ability to be flexible in their actions and decisions, as well as, build their social confidence.